Kite Packaging, one of the UK’s leading packaging distributors, is now supplying a range of unique returnable plastic containers. They are designed to solve handling and logistic problems within the supply chain for a wide range of industries. The range designed by LoadHog and sold by Kite, focuses on increasing load stability, reducing packaging waste, increasing vehicle fill, reducing labour, transport and consumable costs and increasing efficiency throughout industry supply chains. 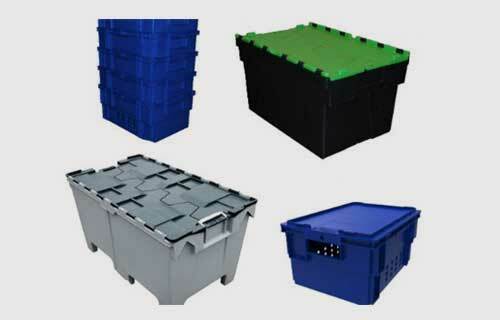 Consisting of a range of attached lid, stackable / nestable and pallet containers, these versatile, robust and reusable products are said to be suitable for a wide range of industries. The ideal solution for reusable or multi-trip packaging requirements, the range provides safe, efficient handling and storage. The innovative lid design allows the lids to secure in a vertical line, meaning no lid overhang. Available in a range of sizes, the attached lid containers work well as a standalone product, however, are also impressive as part of a modular system. They also come in a range of different strengths, virgin material – produced from high impact polypropylene. Repro/virgin – consisting of a recycled polypropylene base and virgin polypropylene lid and Repro – consisting of recycled polypropylene. Stack and nest containers are a full virgin material container produced from polypropylene that stack safely when full and nest when empty saving space in storage. The easy to use container protects products during picking assembly, processing, and storage and distribution applications and is ideal for use in a wide range of industries. Available with or without a lid, all containers come with handgrips to ensure efficient manual handling. The plastic pallet box has been designed as an end-to-end transit system, produced from a tough polyester powder coating; the unique half UK pallet size box is the only stackable and nestable product of its size and incorporates the clever lid design that means the lids sit flat against the box when nested. Designed to be lifted with appropriate machinery, such as forklifts and pump trucks, the patented design provides the perfect balance of carrying capacity and easy handling.